There was a distinctly gamey flavor to these trails, but they were not without their sublime moments. Think deep woods, quiet climbs and aggressive, to-the-point descents. "Two out of four!" Phil yelled over his shoulder. He was referring to the number of kickers we'd climbed. I was bleeding out of my eyeballs, but I managed a weak cheer as he billy-goated up the next section of vertical chunder. "Three out of four!" He shouted down. The risky thing about chasing locals around their stomping grounds is that you're at their mercy. You never know what you're in for, except to the extent that you know them; what we knew about Phil was that he was becoming a train conductor– so he could have more days off to ride his bike. We'd driven through a solid storm for five hours, eating day-olds and drinking coffee. The further North we got the wilder the woods became, with hanks of neon moss clinging to the enormous dark tree trunks. The clouds parted the moment we rolled into Whitefish, and as we set off after Phil we remembered the upside to chasing locals around their stomping grounds: you get the goods. These are the sort of people who, a couple beers deep, are more likely to start talking land-use than they are to spray about their latest epic. 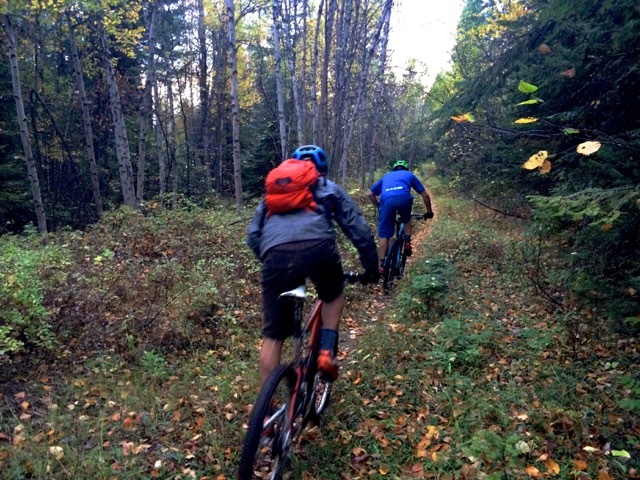 We toured barely-there singletrack through loamy woods, skirted a glacial lake and tore through the twilight for a quick lap on another superb flow trail built by Terraflow. Until we hit the the bermy stuff, we didn't see a soul. There was a distinctly gamey flavor to these trails, but they were not without their sublime moments. Think deep woods, quiet climbs and aggressive, to-the-point descents. The flow trail featured Pete and Linda's signature groomed berms and doubles, along with some fairly committing drops and talk of much spicer stuff up high. 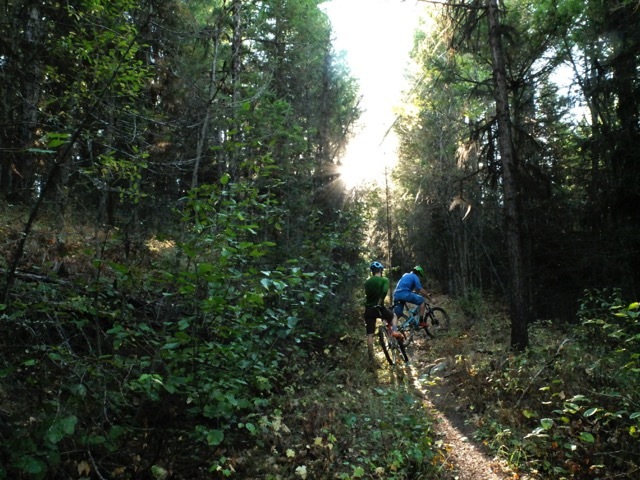 We finished the day over brews and moose stew with members of the local trail club, called the Flathead Fat Tires. These are the sort of people who, a couple beers deep, are more likely to start talking land-use than they are to spray about their latest epic. In Montana, which is about 30 percent public land, conservation issues are alive, well and often volatile– so it was awesome to meet educated and passionate advocates. Unlike some of our stops down South, these are not trails that can ever be taken for granted. The clouds parted the moment we rolled into Whitefish, and as we set off after Phil we remembered the upside to chasing locals around their stomping grounds: you get the goods. 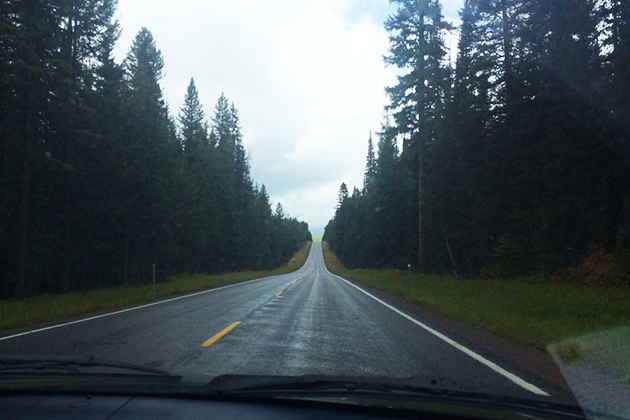 Whitefish is located in the northwest corner of Montana, pretty close to both Canada and Idaho. "It's like Canadian Tijauna" one local joked, but the area has a lot to offer besides cheap groceries for Canucks. Whitefish Mountain Resort, Glacier National Park and iconic Flathead Lake are all within a stone's throw of town, not to mention its proximity to meccas like Fernie, Rossland and Nelson. Of course all the resources in the world don't count for much if you don't have the community to utilize them– fortunately between Terraflow, The Fat Tires and countless others who donate their time and energy, Whitefish is looking pretty good for now. 411: We left town knowing we'd barely scratched the surface. If you're in the area and can't get a hold of Phil, check out the highly acclaimed Kashmir trail or hit up Spencer Mountain, the latest big project and a rippin' good time.